(TibetanReview.net, Dec 01, 2018) – Venerable Palden Gyatso, who had spent 33 years in prisons and labour camps until 1992 for his opposition to the Chinese occupation rule passed away after a short stay at the Tibetan Delek Hospital in Dharamshala, India, on Nov 30 morning. He was 85. The former monk of Tibet’s Drepung Monastery had long suffered from a chronic liver condition and also had other serious ailments as a result of decades of torture and ill-treatment, including shoving of electric rod into his mouth and starvation. He was a monk of the Kirti Monastery, Dharamshala, at the time of his passing away. Coming into exile in 1992, he brought with him almost a complete set of clandestinely acquired torture instruments used by the Chinese on Tibetans at enormous personal risks, something no one else has managed thus far. To him this was a matter of presenting evidences of what he was going to talk about and therefore of utmost importance. And he set out to do what he and fellow Tibetan political prisoners had repeatedly pledged to each other in their prison cells: that anyone who survived the daily routines of savage beating, torture, backbreaking labour, starvation, bestial living conditions, and near-absent medical facility should make every effort to let the outside world know what China was doing in Tibet: systematically destroying the body and spirit of the civilization of a religiously engrossed peace-loving people in unimaginable manners of brutality. These led him to address the UN Commission on Human rights (as the UN Human Rights Council was called in 1995) in Geneva. He gave countless media interviews. He spoke to students and staff at schools, universities, and even in a prison in the USA. He interacted with authors and intellectuals as well as political, government, and business leaders. He collaborated with international human rights and Tibet organizations. He also took part in long peace marches in the USA for Tibet’s independence, organized by Indiana-based International Tibet Independence Movement. And he undertook numerous other types of protest and campaign actions, including a Tibetan Youth Congress-led hunger strike in Torino, Italy, in 2006 to oppose the grant of the 2008 Olympic Games to Beijing. The addresses at the UN Commission on Human Rights and at the inauguration of the Oslo Freedom Forum in 2009, and, particularly, testifying in the Spanish High Court in the crime against humanity cases against top Chinese leaders in 2014 were among the proudest moments of his life. He kept gushing with grim cathartic satisfaction about the fact that in the Geneva event, the Chinese officials had no choice but to listen without interruption to all that he had to say, something unimaginable while he was a prisoner in Tibet. His authoring of Fire Under the Snow in 1998 (which underwent several reprints) and the production in 2008 of a video on his life under the same title were milestones in his quest to keep his pledge to his fellow-political prisoners, many of whom never made it out of the Chinese gulag in Tibet. It was a matter of great satisfaction to him that the book has been translated into numerous other major languages of the world. The story of his life and his indefatigable spirit earned him great many admirers and supporters not just for himself but also for the Tibet issue. In particular, it earned him the John Humphrey Freedom Award of the Canadian human rights group Rights & Democracy in 1998. Among his many admirers were two families in California who treated him as a family and whom he visited almost every year for months of stay and medical treatment for the last more than 10 years. It was thanks to them and the medical treatments, given at the Mayo Clinic, that he was able to live so long despite suffering from a host of serious and chronic ailments. In fact he returned from his last visit to them on Oct 17 after it was found that his liver condition was beyond possibility for surgical treatment. 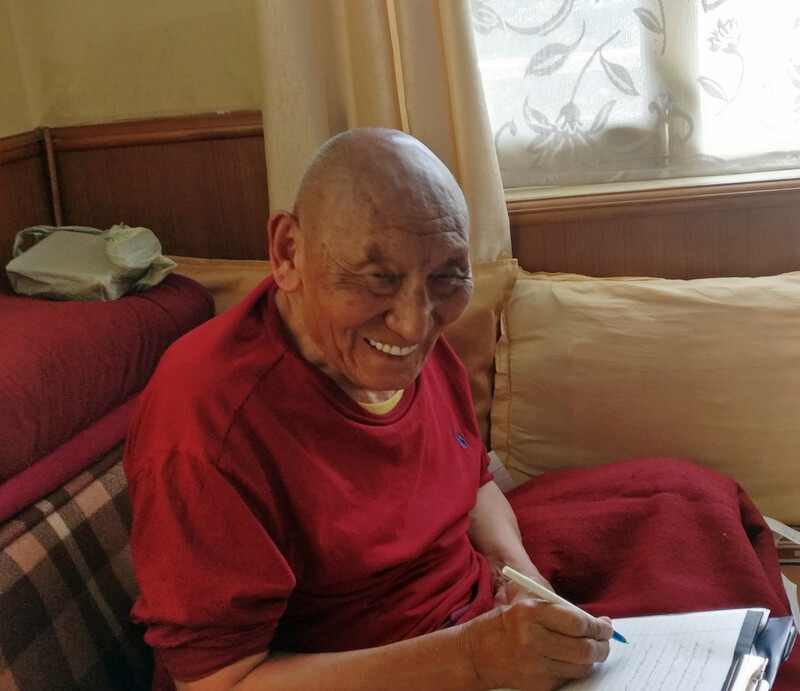 Palden Gyatso-la, a supporter of Tibet’s complete independence until his last breath, was thankful for having lived for so long despite his frail physical conditions and always brimmed with gratitude to many other the friends and supporters as well who made this possible. And yet, he was also clear about being ready to leave this world any time it comes. Though suffering from an inoperable liver condition, his death was without any pain. Palden Gyaso-la did not hate that the Chinese. In fact, he would say, it was a Chinese prison guard who at one time saved his life, whispering over to him from out of a group of fellow prisoners for reason he could not fathom to give him a sumptuous meal at a time when he felt sure that he was dying from starvation. Palden Gyatso-la was born in a village of Panam town in southern Tibet in 1933. He joined the local Gadong Monastery in 1943 and latter enrolled at Drepung Monastery in Lhasa where he said Professor Samdhong Rinpoche was among his classmates. Following China’s brutal suppression of the Tibetan uprising in March 1959, he was held, initially on allegation of spying for India probably because his teacher was from Kinnaur and he had taken him safely out of Tibet. He was later accused of being the leader of a rebel group at Drepung, which he was, and eventually jailed for seven years. He escaped in 1962 but was caught at Dram near Nepal’s border. This earned him eight more years in jail. He completed his sentence in 1975 but was, instead, transferred to a labour camp where conditions were just as bad. After spending eight years there he was rearrested in 1983 for having put up posters in Lhasa calling for Tibet’s independence after sneaking out of the camp in the night. This eventually earned him eight years in jail. This was raised by one year following suspicion that he had sneaked out notes about prison conditions to the outside world through visitors. He was finally released on Oct 7, 1992. He bribed a Chinese officer to buy a set of his torture equipment with which he escaped, dressed as a Chinese gentleman, after spending 13 days in Lhasa preparing for the journey.